I usually stalk the Disney Store's website at least once a week in search of new things that have been added and as there is a lot of great things on there at the moment I thought it was about time for another wishlist! How gorgeous are these deocrations? I've been slowly building up a collection of Disney Christmas decorations over the past couple of years and I'll definitely have to be adding these two to it this year! 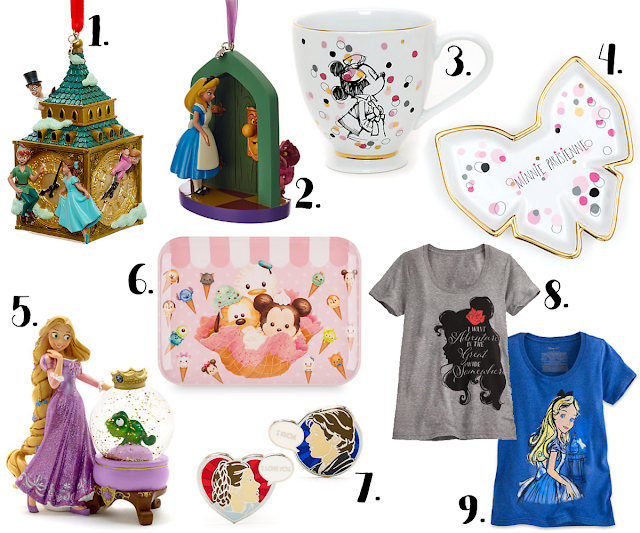 I especially love the Peter Pan Big Ben one, it's so magical! Next on my wishlist is these oh-so-pretty homeware pieces from the Minnie Mouse Parisienne collection. There's lots of different of different bits to choose from in this range including plates and teapots but the mug and snack dish have caught my eye the most! I love both Paris and Minnie Mouse style so I'm just a wee bit obsessed with these! Although I have a collection of Christmas decorations I don't yet have a Disney snowglobe so I think I'll have to correct this travesty soon with this adorable Rapunzel and Pascal snow globe. I like that it isn't obviously Christmasy as well which means I'll be able to keep it out all year round! I have the water bottle and bowl from this collection and they're so cute so now I'm after the equally adorable serving tray as well. This'll be perfect for getting my snacks and hot chocolate upstairs in one piece for snuggling up in bed with a Disney film! Okay Disney Store, you win ALL of the points for this pin set design. In case you can't see from the picture it's a set of pins, one of Leia and one of Han Solo and their classic lines "I love you" "I know" - how bloody amazing?! I need to get my hands on these! And finally I've also been a tiny bit in love with these Belle and Alice t-shirts. I personally find the clothing designs from the Disney Store to be a bit hit-or-miss usually but these two are absolutely stunning. Plus they're currently on offer at 2 for £20, making them just £10 each if bought together! So, in conclusion I *definitely* will be placing a HUGE Disney Store order when my student finance comes in again in October... Because that's totally what that money is for, right? !